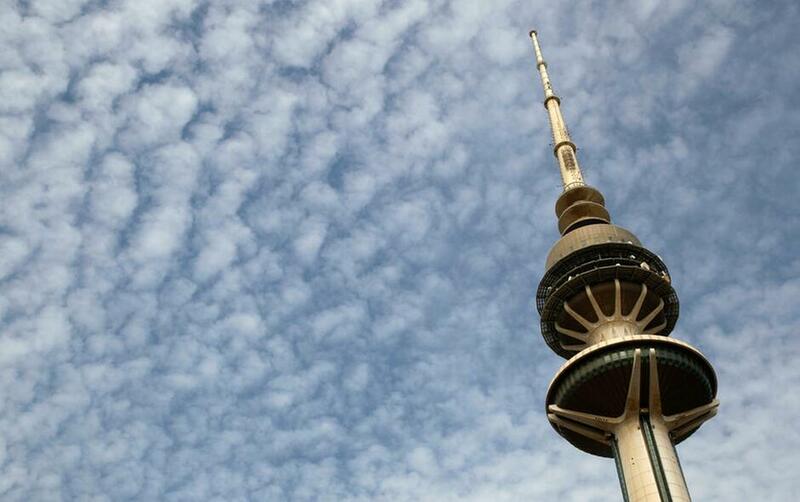 Kuwait's Liberation Tower is seen in Kuwait City, Kuwait, Monday, Feb. 12, 2018. Kuwait this week is hosting a series of conferences on rebuilding Iraq after the onslaught of the Islamic State group. Authorities estimate Iraq needs $88.2 billion to restore a country smashed after the Sunni extremists seized the country's second-largest city of Mosul and a mass of territory in June 2014. While the U.S. will not make any new direct aid pledges at the conference, Secretary of State Rex Tillerson is expected to announce an over $3 billion financial package, an American official said. Still, far more money will be needed, Iraqi officials say. "We finished one battle but we are engaged now with a war for reconstruction," said Mustafa al-Hiti, the head of Iraq's reconstruction fund for areas affected by terrorist operations. Among the hardest-hit areas is Mosul, which Iraqi forces, aided by Iranian-backed Shiite militias and a U.S.-led coalition, recaptured in July 2017. Their victory came at a steep cost for Mosul, as coalition airstrikes and extremist suicide car bombs destroyed homes and government buildings. "The majority of the damage was to western Mosul as it went through one of the worst and fiercest battles in history," said Nofal al-Akoub, the governor of Iraq's Nineveh province. It "led to the total destruction of its infrastructure." Al-Akoub said $42 billion was needed for his province alone, as it is home to Mosul. Iraq needs some $20 billion now to begin its reconstruction, al-Hiti said. The war against the Islamic State group displaced more than 5 million people. Only half have returned to their hometowns in Iraq. However, officials acknowledge a feeling of fatigue from international donors, especially after the wars in Iraq and Syria sparked the biggest mass migration since World War II. President Donald Trump himself on Monday tweeted that America was "so stupidly spending $7 trillion in the Middle East, it is now time to start investing in OUR country." Billions of dollars poured into Iraq after the 2003 U.S.-led invasion that toppled dictator Saddam Hussein, with what feels now like little visible effect. While Iraq is OPEC's second-largest crude producer and home to the world's fifth-largest known reserves, it says it needs $7 billion to repair its oil and gas fields. It has struggled to pay international firms running them. Even in Kuwait, some social media users questioned the focus on Iraq, asking why more wasn't being done in their own country. The Middle East as a whole, especially countries like Kuwait whose deep pockets rely on oil production, have taken a hit in recent years as energy prices crashed and only recently began regaining ground. Kuwait, hosting the conferences this week, has a deep interest in seeing a stable Iraq, especially after Baghdad's 1990 invasion of their small, oil-rich emirate. It announced $330 million alone had been pledged Monday for Iraq at a humanitarian conference in Kuwait City. That money is desperately needed as more than 4 million children are in need of humanitarian assistance while 3 million are unable to regularly go to school in Iraq, said Geert Cappelaere, UNICEF's regional director for the Middle East and North Africa. One out of four Iraqi children across the country live in poverty in the nation of 37 million people. "There may be donor fatigue, but no one today can tell me there isn't money. There is money to continue fighting, there is money to continue agendas that are not serving children," Cappelaere said. "What we are asking today is to put that money where children's interests are and we may get in the Middle East a much-brighter future." "We know that many people think about, 'OK, it's the second time we have to rebuild Iraq,' ... (but) we have to get it right this time for the Iraqi people," Ritz said.